Snap Frame: This changeable board, sidewalk sign is designed for outdoor usage! Our sidewalk sign is extremely easy to use and is a very versatile product. Display it indoors, or outdoors because the weather will not affect it. Your sidewalk sign is safe in rain and winds up to approximately 20 mph. 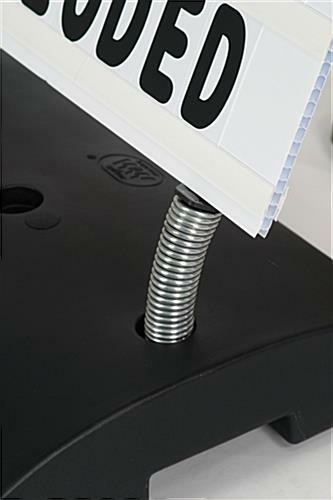 The solid construction of the sidewalk springer sign makes it virtually indestructible. With these sidewalk springer signs, the sign itself is made of corrugated plastic and the base is made from heavy duty plastic, which can be filled with sand or water for even more stability. Our sidewalk sign is an affordable, portable and an easy to assemble product. 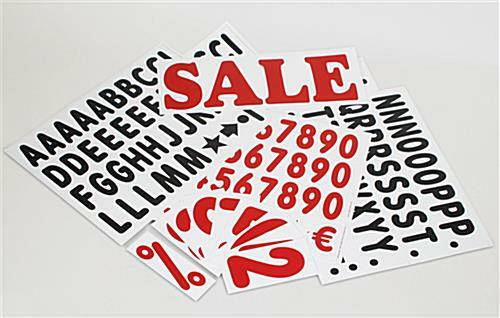 Compose your outdoor display using letters, numbers, symbols and headers. Once you've set up your letter boards using the included materials, just slide the sign onto the metal posts and you're ready to draw a crowd! This sidewalk sign is the ultimate outdoor display that commands attention with its contemporary design. Each side of the sidewalk springer sign is tracked for 7 lines of changeable letters. The sidewalk sign is also double-sided for greater advertising power. With outdoor signs like this sidewalk sign, you can change your message in minutes. 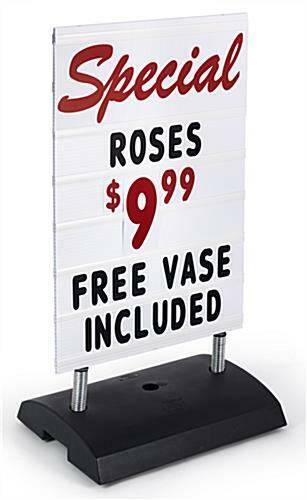 Convert a daily special to the night's menu in a flash with these portable sidewalk signs. Simply slide the letters in and out of your sidewalk letter board. Changing the message on your sidewalk springer sign has never been easier! Springer Base: 18" x 24" x 5"
Letter Board: 24" x 36" x 0.5"